Vancouver, British Columbia, October 5, 2017 Harvest Gold Corporation (TSX.V: HVG) (“Harvest Gold” or the “Company”) is pleased to announce initial results of part of its Phase 1 exploration program at its high-grade Cerro Cascaron gold-silver project in Mexico. The program successfully identified six significant silver-rich polymetallic veins at the Cascarita prospect and provided a stronger structural understanding of the area through underground sampling of historic adits. High grade silver with strong lead and zinc values were encountered within the adits. The Cerro Cascaron project covers 69 square kilometres in a historic Colonial-era mining district in the prolific Sierra Madre Occidental precious metals belt of western Chihuahua State, Mexico. 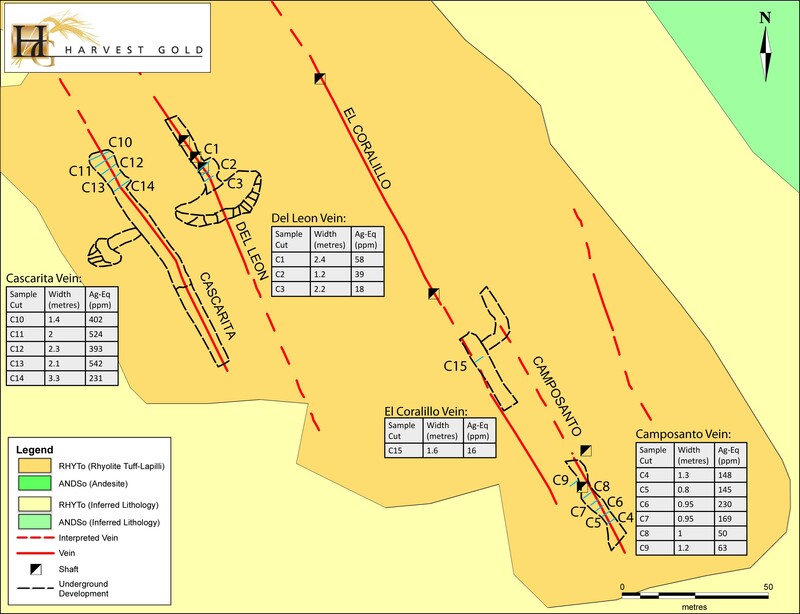 The sampling of historic adits at La Cascarita provided five channel sample cuts with widths of 1.4 to 3.3 metres that grade between 231 and 542 g/t silver equivalent*. 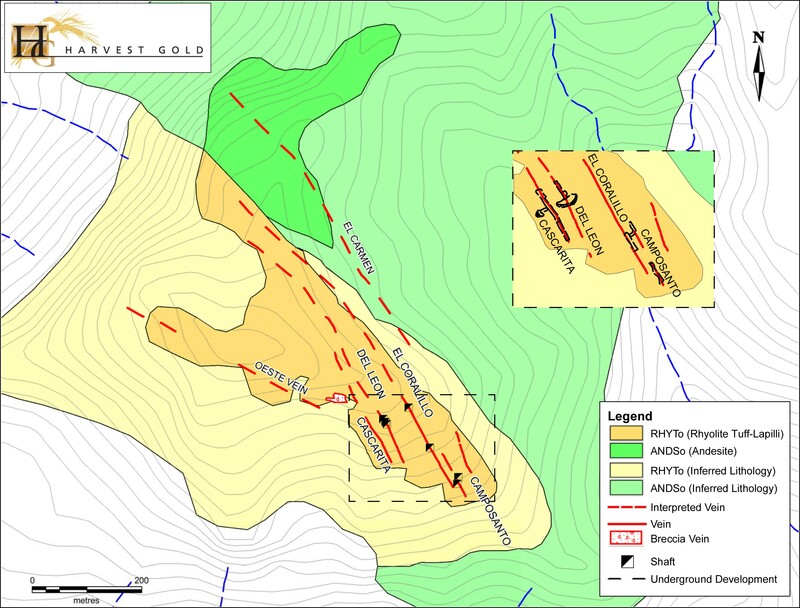 Associated prospecting also identified a silver rich poly-metallic vein field that includes six sub-parallel vein systems within a 900 metre by 300 metre corridor. Historic artisanal development on the structures of Cascarita area are open to the northwest and southeast. The prospect has never had modern exploration of any kind. This large vein field has become another early priority for the Company and more detailed mapping and surface sampling is underway. *Note: Silver-Equivalent Ag-Eq = Ag + (Pb%*22.046*Pb price*31.103/Ag price) + (Zn%*22.046*Zn price*31.103/Ag price). Metal prices used for this formula: Ag = $US 16.25/oz, Pb = $US 1.00/lb, Zn = $US 1.25/lb. 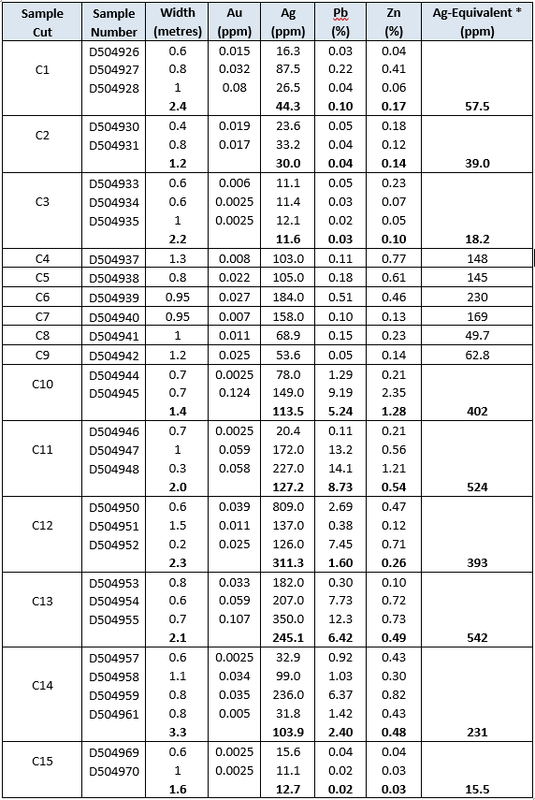 Recoveries of 100% are assumed for the silver-equivalent values. In the Cascarita area, six vein systems are present within a 900 metre by 300 metre corridor of northwest-striking structures. The fault-bounded structures attain appreciable widths of up to 3.3 metres with associated and locally extensive zones of stockwork veining up to 20 metres wide that locally link parallel structures. Mineralized structures comprise dominantly quartz±barite breccia-veins with polymetallic sulphides. Quartz textures include colloform and drusiform quartz and local amethyst. Boiling textures are present as quartz pseudomorphs after bladed calcite at the Coralillo Vein. Polymictic breccias that locally include quartz vein fragments suggest significant reactivation and movement along faults. Significant base metal sulphide development is reflected by very high lead and zinc with anomalous copper, arsenic and antimony geochemistry. Veins and sampling locations are shown in Figures 1 and 2. The northwestern extension to these structures will be explored for projections at higher topographic levels that may be more favourable for gold mineralization. The geologic setting of the Cascarita area appears to be centered on a rhyolitic dome however follow-up mapping and sampling is required to define the exploration potential. Towards the upper parts of the veins, for example, the barite becomes an important component and can be utilized as another prospecting guide for extensions of the vein systems. As a follow-up, detailed mapping will be conducted in the current exploration program, prior to determining drill targets. Readers should refer to Evrim’s press releases dated June 8 and August 17, 2016 and Harvest Gold press releases dated June 8 and 15, 2017 for a full description of previous exploration results. Mr. Warren Bates, P. Geo (APGO#0211), the Company’s Director of Property Investigation, is the Qualified Person for this press release for the purposes of National Instrument 43-101, and has reviewed and approved the technical information herein. Samples were collected perpendicular to the structures from hanging wall to footwall. Evrim Resources has advised that their quality control procedure is as follows: Samples were delivered to ALS Global in Hermosillo, Sonora for sample preparation and to the ALS laboratory in North Vancouver for analysis. The Hermosillo facility has ISO 9001:2008 certification while the North Vancouver facility has ISO/IE 17025:2005 certification. Blank samples were inserted into the sample sequence for all channel samples with noted visible gold with no indications of contamination. Samples were assayed for gold by 30 gram fire assay and multi-element analysis by aqua regia and four-acid ICP analysis. Selected samples with coarse or visible gold were re-analyzed by 50 gram screen metallic assay.